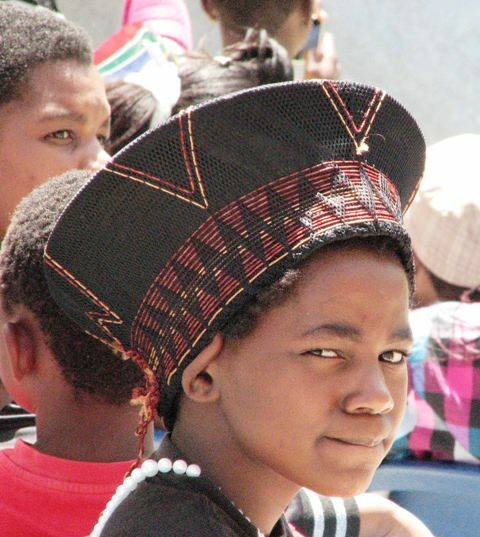 Today is Heritage Day, a public holiday celebrating the cultural heritage of South Africa. Similar to Labor Day and Memorial Day, Heritage Day seems to serve mostly as an excuse for a long weekend. 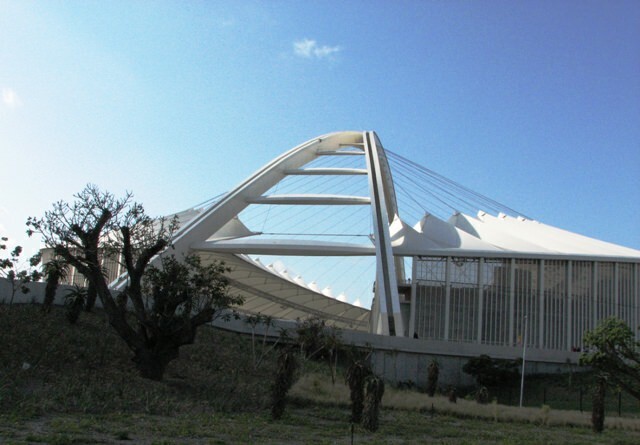 This year the holiday coincided with the end of the ANC General Council meeting so there was a big event at Moses Mabhida Stadium – the brand-new world cup venue in Durban. 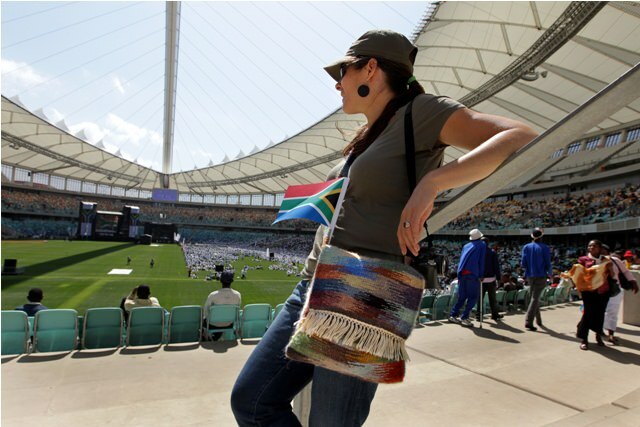 The specific theme of the event, in addition to South Africa’s heritage, was the success of the 2010 World Cup. The guest of honor was President Jacob Zuma. Joe photographed the event and I tagged along, as usual. At the stadium (photo courtesy of Joe). We arrived around 10:00 a.m., just as the festivities were starting. The stadium is a brilliant work of architecture – sleek, modern, airy, and cool, all at once. It somehow evokes both a spaceship and a beach tent. 1) A religious service by the leader of Shembe, the Zulu Nazareth Baptist Church. 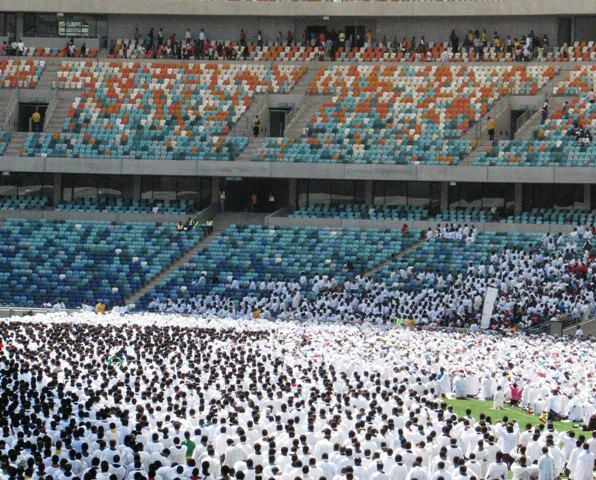 Thousands of church followers knelt in the stadium infield, all dressed in white smocks. They sang hymns and blew horns that were similar to vuvuzelas, just larger and less annoying. A sea of Shembe parishoners. The men are on the left (hatless) and the women are on the right (wearing hats). 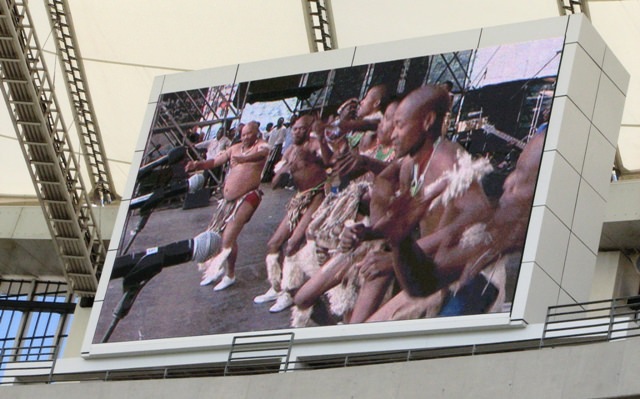 2) Multiple performances by male Zulu dancers. I saw a similar version of this dancing a few years ago in Swaziland and it mesmerizes me. The men, clad in beads and animal skins, stand in a row and stomp in unison. Then they take turns dancing individually and kick their legs high in the air. When I say high, I mean high. Their toes often stretch behind their heads. Sometimes the dancers finish off with a split. I was too far away from the stage and couldn’t get a good photo of the dancers. So I had to photograph them on the Jumbotron. The guy on the left is the leader. He can’t kick as high as the others for obvious reasons. 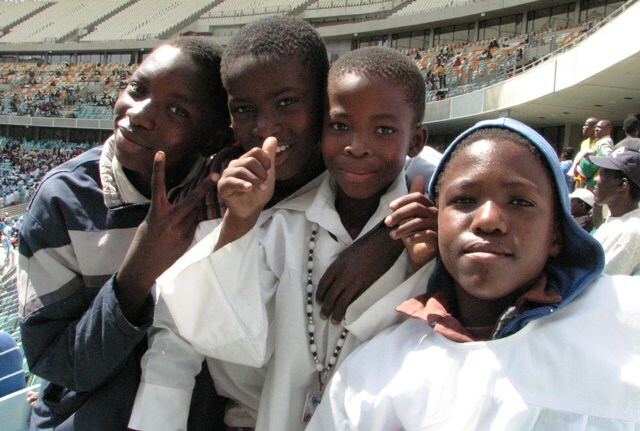 The events were interspersed with highlights from the World Cup, shown on the jumbotron. 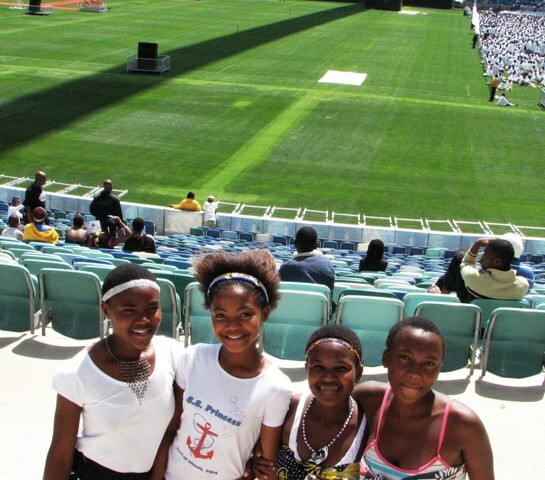 We saw every goal scored by Bafana Bafana, the South African soccer team, about 100 times. The crowd went wild each time. My favorite part of the day was people-watching. 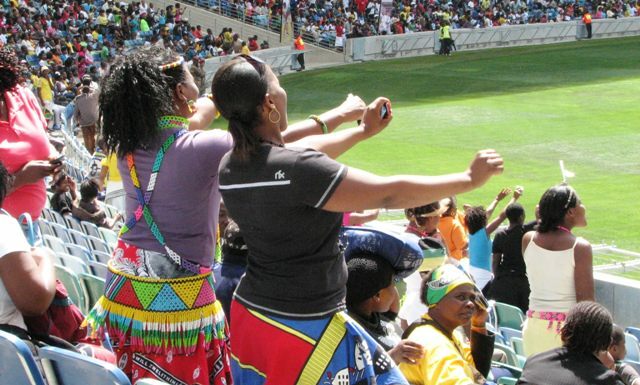 Many of the spectators, especially the women and girls, came dressed in traditional tribal attire – skirts and tops and headdresses decorated with colorful beadwork. 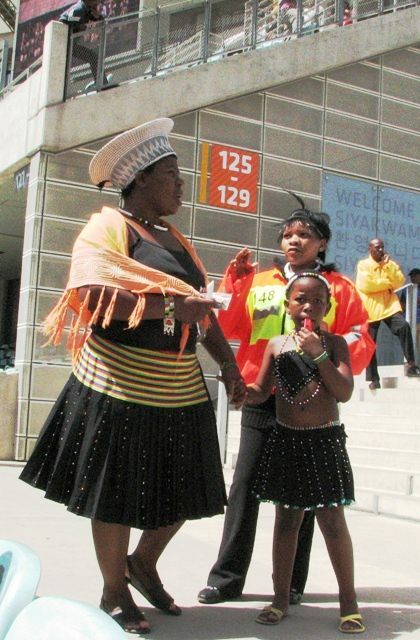 A traditionally dressed mother and daughter consult with a stadium usher. I tried to take pictures without making a spectacle of myself, but I was one of very few non-Africans in the crowd and hence attracted some attention. I made lots of friends. Zuma was scheduled to speak at around noon. But the praying, dancing, and singing stretched on for hours with no sign of the president. By 1:00 p.m. I was starting to feel a bit tired and hot. Joe called to say Zuma was running late and would arrive a bit after 2:00. I sighed and applied more sunscreen. Finally, it was time. The Jumbotron showed the president’s motorcade on its way. The presidential guard and military band marched onto the field. Then the president himself arrived and sat on a dais. There were anthems and airplane flyovers and a 21-gun salute. And more Zulu dancing – yes. At last, the president was about to speak. I thought. But no! More speeches by various officials. Each speech was long, and made longer by the fact that it was delivered in both Zulu and English. I know this is the way in Africa — I’ve experienced it many times. But I never get used to it. Joe had all the photos he needed and came to find me in the stands. We left before the president’s address. I’ve never seen a sitting president speak before and had been looking forward to it. But after five hours I was happy to go. We ate our last dinner in Durban at the same place where we ate our first – Al-Mehran. 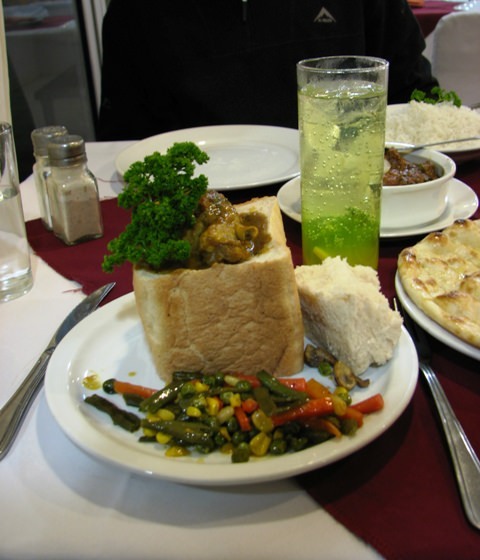 I finally had a Durban bunny chow and it didn’t disappoint. It was further enhanced by a passion fruit cola — a magical concoction of passion fruit juice, cream soda (which is fluorescent green here), and lemonade, with a twist of parsley and lemon. Perfection. Hot chicken bunny chow and passion fruit cola. Seriously delicious. We’ve decided there’s no reason to eat Indian food anywhere else in Durban. It’s Al-Mehran or nothing.